Super busy weekend. 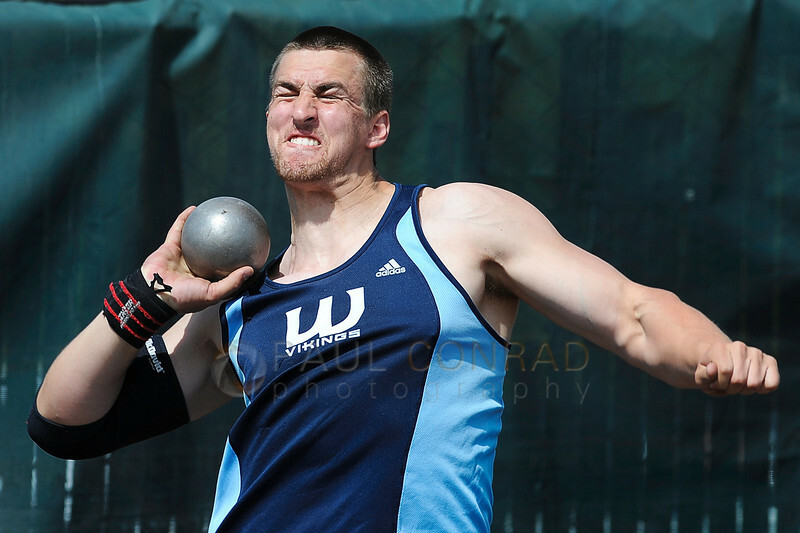 After a busy day on Friday shooting the NWC Championship Track and Field event at Civic Field in Bellingham, Wash., my friend Andy Bronson, photographer for the The Bellingham Herald, called me in to cover as they needed an assignment shot. 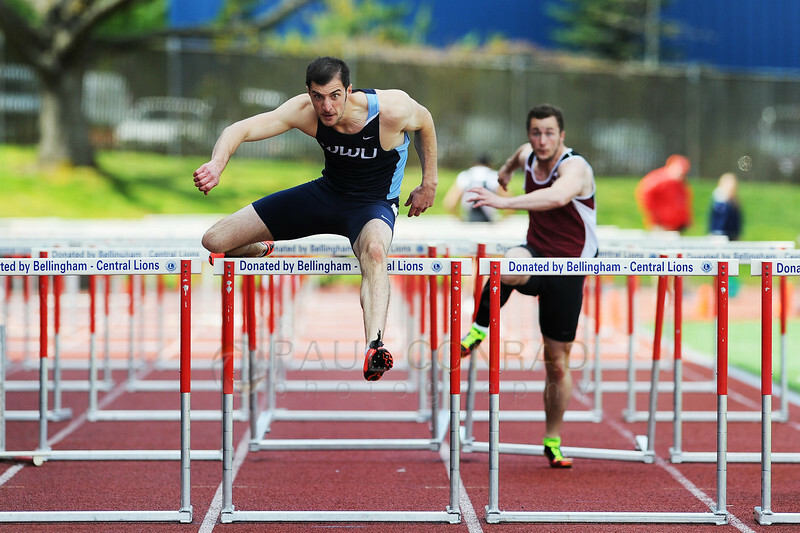 My job was to go to the 2014 Ralph Vernacchia Invitational hosted by Western Washington University at Civic Field. I had no assignment sheet but Andy gave me one specific photo they wanted: Retired WWU Coach Ralph Vernacchia, the man the event is named for, had come into town from Arizona where he now lives. The sports editor wanted a photo of him on the field. © Paul Conrad/The Bellingham Herald – Western Washington sophomore Katelyn Wright of Washougal, Wash., clears the bar at 5′ 3.75″ to win the Women’s High Jump during the 2014 Ralph Vernacchia Track and Field Meet at Civic Field in Bellingham, Wash., on Saturday April 26, 2014. Not so bad, I like that type of photojournalism. Interaction photos are my favorite to capture. This will be a fun assignment, but then again, all of them are always fun on some level. I’m a firm believe that there are no bad assignments, just bad photographers. Those assignments make me push myself even harder to get something creative. My wife Heidi says I feed off that. Anywho, as I remembered the layout from the High School competition, I can plan my shots a bit easier and even stretch myself. I don’t like feeling like I fell in a rut. So when I go to the same place, be it a playground, sporting venue, or even a city council meeting, I push myself to get something new and different. For one, find a better angle from what I shot the previously. Get back, get closer, use a longer lens, go wide, go low, and mostly, don’t have a lead finger and burn. Anticipate moments, study the individuals, take a moment to observe. So, off to the The Herald to pick up a D3 and 300mm f/2.8. A hefty combination. It’s been quite awhile since I’ve shot with a 300mm lens. But I’ll endure I’m sure. It’s just a lens. 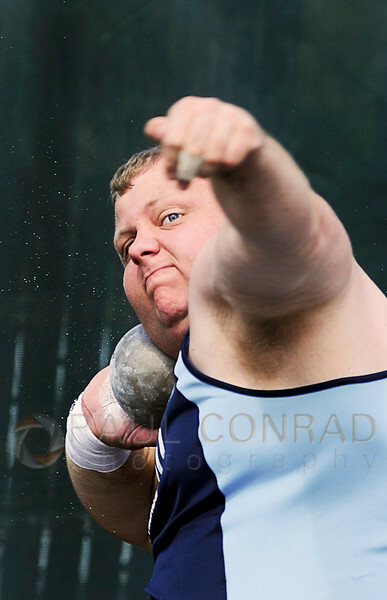 © Paul Conrad/The Bellingham Herald – Western Washington University junior Ryan McDonald of Bellingham, Wash., hoists the shot put during the men’s competition at the 2014 Ralph Vernacchia Track and Field Meet at Civic Field in Bellingham, Wash., on Saturday April 26, 2014. McDonald had a best distance of 44 feet, 7 and a half inches earning him 13th place. The day was pretty bleak. It wasn’t raining but it looked like it would rain at the drop of a hat. The meet began at 10 a.m., but I got there at 11. My first order of business was to go to the officials area to see if anyone has a roster and knows where I can find Mr. Vernacchia. The roster was easy. The woman at the table told me they knew him, but had not seen him. So I gave them my number and asked them to call me if they see or hear that he’s here. With roster in hand, I read what events were going on and looked at where they are. Watching, I noticed the high jump going on and figured they may be in the finals. And I was right. Only 2 woman left: One from WWU and the other from Central Washington. I quickly found a spot on the other side of the track, sat down on the ground and hefted the 300 to my eye. Watching the background, I moved until it was nice and clean with only trees and the skyline. But, while moving WWU sophomore Katelyn Wright of Washougal, Wash., took her turn and I shot. But I didn’t like the background, so while sitting and looking through the 300mm, I moved to get a nice clean background. Then she took her second turn and I got her as she flew over the bar. 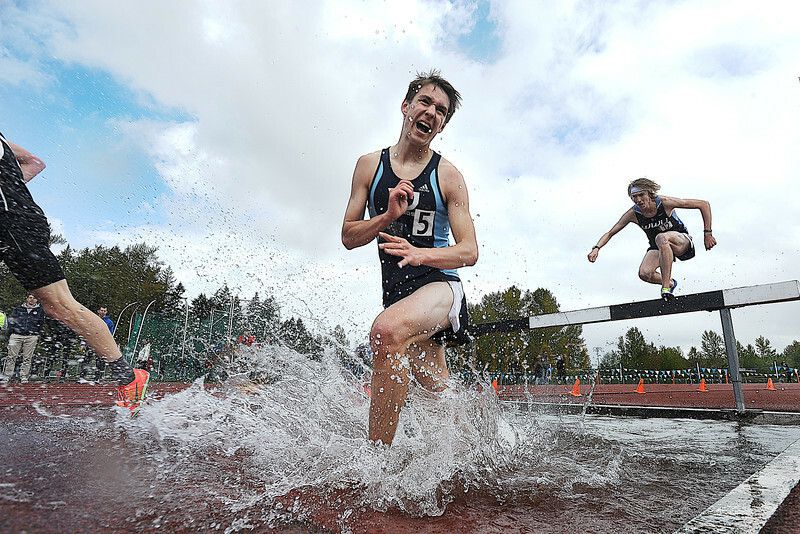 © Paul Conrad/The Bellingham Herald – Western Washington University freshman Noah Ripley of Wasilla, Ak., grimaces in pain after taking a hard landing during the Men’s 3000m Steeple chase at 2014 Ralph Vernacchia Track and Field Meet at Civic Field in Bellingham, Wash., on Saturday April 26, 2014. Ripley came in 6th place with a time of 9 min., 45.46 seconds. As I worked my way around the track, the rain began falling. Misty at first, but by the time I got to the Pole vault, it was pretty heavy. So covering the gear, I ran under the stands. A 15 minute rain delay ensued. As I was shooting shot put, they began the Woman’s 3000m Steeplechase. It is what it’s called: runners jumping over barriers, some into water. Oh yea, fun to shoot. 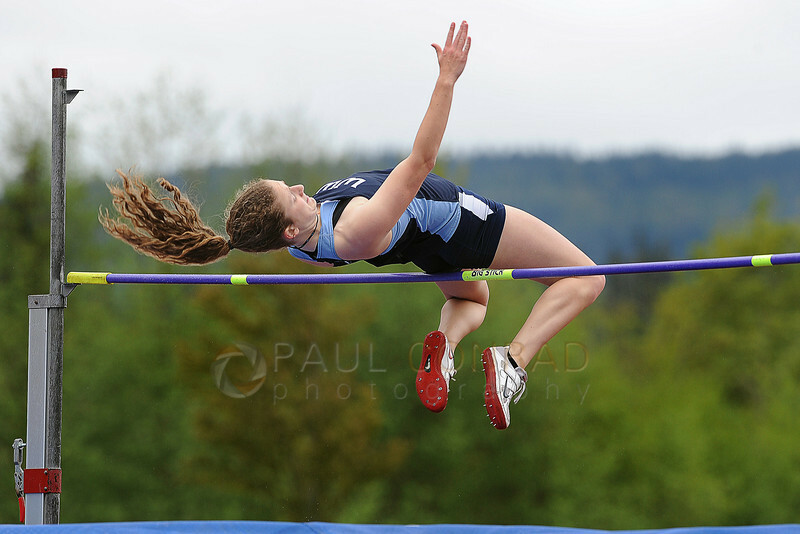 © Paul Conrad/The Bellingham Herald – Western Washington University freshman Morgan Annable clears the bar during the Woman’s Pole Vault in the 2014 Ralph Vernacchia Track and Field Meet at Civic Field in Bellingham, Wash., on Saturday April 26, 2014. Annable took second place with a height of 10 feet, 8 inches. Got close on the water and as they began jumping over the barrier, I would begin shooting. Most didn’t come out after the first splash, water on a lens isn’t very transparent. But I got a few zingers. I saw the assistants setting up the hurdles. While watching, there was one shot I’ve always liked and wanted to duplicate: looking through the hurdles to the start line. I saw it once during the 90s when it won a POY award. So, I went to the finish line and with the 300, kneeled on the ground and looked through the hurdles. Pretty cool. But, it was too loose. Lots of space above and below. The left to right looked nice as you could only see down one row. And the light was beautiful. I waited for a WWU student to run. The Herald only would run photos of Western students. And only one runner was from Western so I focused on him. I shot through as he set his chocks and the started. After I heard the gun go off, I quickly bounce to my feed to shoot him as he went over the hurdles. Fun times and the pain in my knees is proof. 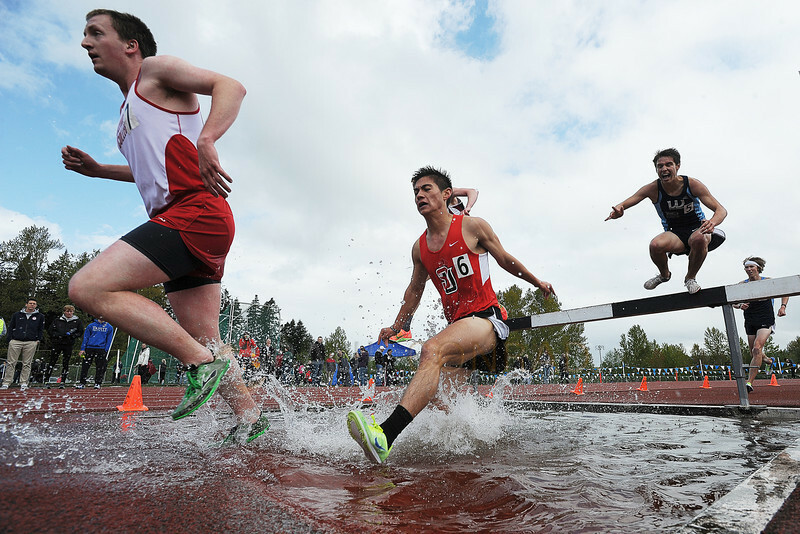 © Paul Conrad/The Bellingham Herald – Western Washington junior Logan Myers of Olympia, Wash., launches during the start of the Men’s 110 meter hurdles the 2014 Ralph Vernacchia Track and Field Meet at Civic Field in Bellingham, Wash., on Saturday April 26, 2014. Meyers came in second with a time of 14.69 seconds for a new personal best. After I shot that, the announcer directed everyone’s attention to the “Man in the Fedora.” Mr. Vernacchia showed up and was roaming the stands. Being as he was my primary assignment, I had to literally hunt him down. When I found him, he was at the Woman’s Javelin watching Western sophomores Katie Reichert and Bethany Drake. So I shot a few of him there. After the competition was over, he stayed to chat with old friends. Katie and Bethany walked over and talked to him. Kinda poignant to get him with some new students. 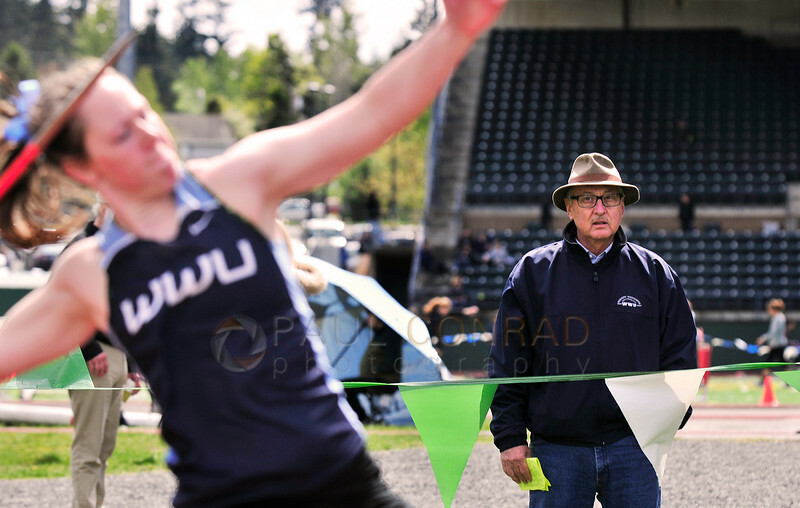 © Paul Conrad/The Bellingham Herald – Retired Western Washington track coach Ralph Vernacchia, right, of Scottsdale, Ariz., observes WWU sophomore Katie Reichert of Kelso, Wash., compete in the Woman’s Javelin during the 2014 Ralph Vernacchia Track and Field Meet at Civic Field in Bellingham, Wash., on Saturday April 26, 2014. The invitational is named in honor of Vernacchia’s long time service. Reichert took 2nd place in the competition. With nearly 4 hours shooting games, I was pretty much done. The only issue was to get the results so I can identify the individuals in the photos. That to me was the biggest challenge of the day: getting proper names and spellings. 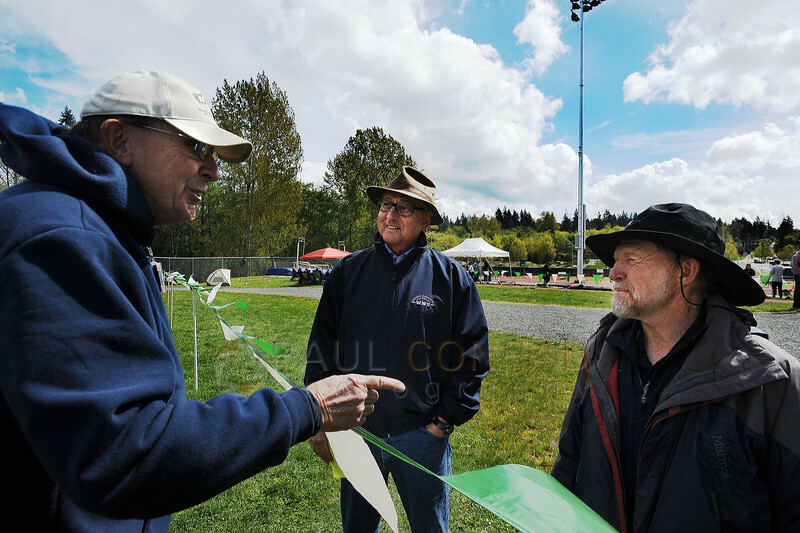 © Paul Conrad/The Bellingham Herald – Retired Western Washington University track and field coach Ralph Vernacchia, center, chats with javelin referee Bob Sund, left, and current WWU coach Pee Wee Halsell during the 2014 Ralph Vernacchio Track and Field Meet at Civic Field in Bellingham, Wash., on Saturday April 26, 2014. 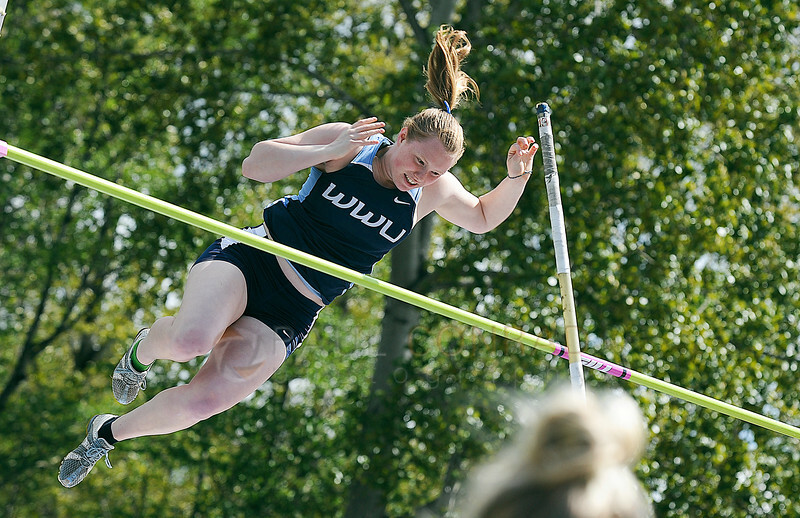 The WWU track and field even is named in Vernacchia’s honor. Sunburned and tired, I headed to the Official’s tent to thank them and get final results. Then off to the paper to download and edit for the Sunday edition and the online gallery: 33rd Annual Ralph Vernacchia Track and Field Invitational. 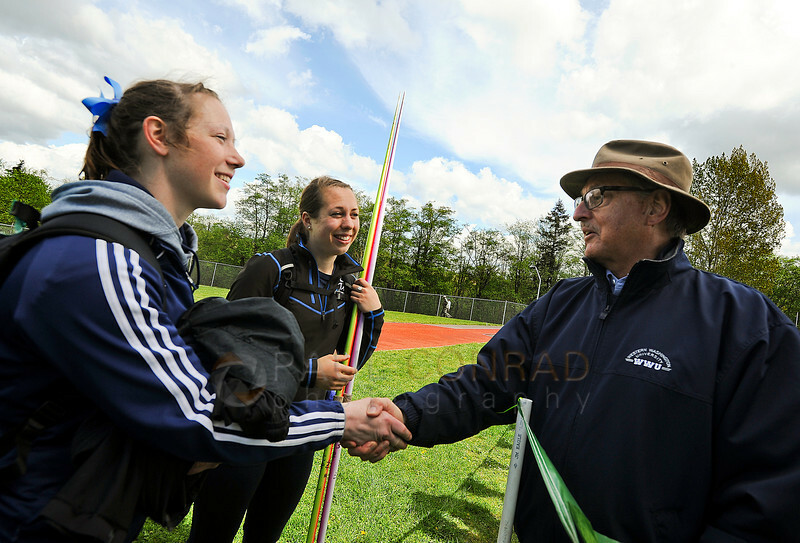 © Paul Conrad/The Bellingham Herald – Western Washington University sophomores Katie Reichert, left, of Kelso, Wash., and Bethany Drake of Sandy, Ore., chat with retired WWU coach Ralph Vernacchia during the 2014 Ralph Vernacchia Track and Field Meet at Civic Field in Bellingham, Wash., on Saturday April 26, 2014. The annual event is named after the retired coach. Glad you like the pix.